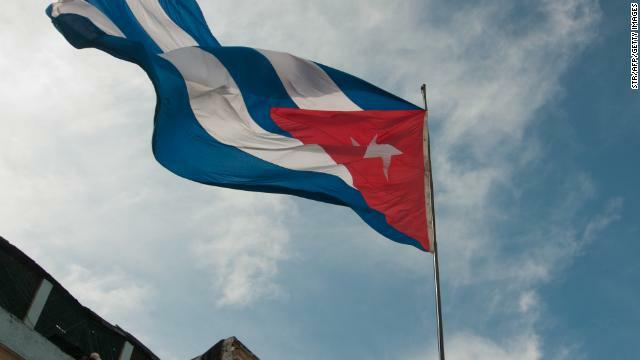 Cuba halts consular services in the U.S.
Cuba halted consular services in the United States on Friday because the American bank it was working with is severing their relationship, the Cuban Interests Section said. M&T Bank informed the Interests Section last year it was getting out of the business of providing banking services for diplomatic missions, but agreed to accept Cuban deposits through February 17. Going forward, consular assistance will "only be provided for humanitarian cases." Marie Harf, a State Department spokeswoman, said the agency has been "actively working" with the Cubans to identify a new bank, and has reached out to more than 50. Harf said that several banks may currently be exploring the possibility of providing services, but that it was unclear whether it could be worked out by March 1, when the accounts will be closed. What to do with Cuba, I feel like it's such a back-and-forth relationship two steps forward one step back . Cuba and America have always been two separate countries with two different trade visions dating back to day's of communism in Cuba, the United States of America see's Cuba as a trade threat to their economy which dates back to those old black and white history videos we shown in school about Cuba and the Cuban missile crises which scares most Americans about Cuba. Being an American who has traveled to Cuba and seen how it's a changed country which has a great health care system which comes a close second to the America health care system, also life is bit different down there they take things at a slower pace and don't worry about the past or the next day. As Americans we can agree that stopping American consular services, in Cuba is not a great idea, because we value our safety when traveling to foreign lands and this why as Americans we pay our taxes so our US Consular Services can help us when we get into trouble across the world in Cuba for years to come. Correction, without taking money from America..
Evidently neither you nor The Venezuelan ever got past the 5th grade in school, judging by your posts here, Yr. I've never seen such ignorance as this regarding Cuba and I was there! Enough said. Cuba needs the money, they will find a way to start business sooner rather than later. Money from Miami keeps Cuba and its government alive. Cuba would become Haiti if this problem last 1 year. Every Cuban born citizen born after 1970 needs to get a visa from the Cuban government to visit his/her own country. The Cuban government charges almost $450 per Cuban passport to every cuban born individual, and a stamp is needed every 2 years in order to visit Cuba in addition to the passport. I forgot the passport only is valid for 6 years total, plus charges for the "visa" biannually . The Cuban government "LOVES" his citizens, they keep the country afloat. Is that you again Phunnie boy, posting under the name of The Venezuelan? If not, then you're the stupidest blogger we have here! Such idiocy like yours should be outlawed!!! Our majority of citizens only parrot to others that U.S. global military strength and expansionism and weapons productions and weapons sales will make us safer when instead the opposite is surely true. And even our most patriotic and brave soldiers will not be able to protect us from our foreign blunders. And even our most patriotic and brave soldiers will not be able to protect us from those who fear U.S. global military expansionism and from those who covet our sold weapons of mass destruction and from those who despise the arrogance of U.S. actions and its failed foreign policies. And the U.S. is the supreme military and economic power behind a worldwide military-industrial complex. And it is no surprise that our struggling U.S. and world economies, temporarily supported by weapons productions and sales, will continue to only flounder on by if...only if our "Masters of War" can fuel even more wars…even more foreign wars fueled by our failed foreign policies and with our sold weapons of mass destruction. And when “world peace’ is somehow discovered and is somehow forced upon even the U.S., the worldwide military-industrial complex, led by the U.S., will collapse. And this collapse will create a global economic depression and social upheaval that will put the “Great Depression” to shame. Because this will be the price all world citizens will have to initially pay as we finally try to make right our past moral wrongs. Very well put, Donald. Thank you. For 55 years, the Cubans of Miami have been sending huge amounts of dollars, disguised as political contributions, to dozens of key Congressmen in Washington so the Congress would allow them to continue enjoying these enormous immigration and economic benefits that Cubans receive in the U.S. immediately arrive..... 55 years enjoying a permanent Immigration amnesty specially drafted by our members of Congress to benefit only to Cubans. And this is still happening today......According my Larousse dictionary, this kind of "political contributions" have a name: Bribes. Well stated, nostradamus. How true that rings! I hope they cut all tire with Cuba and the embargo gets tighter against Cuba for what they are doing in Venezuela. I just heard several aircraft flights totaling several thousand Cuban soldiers were sent to Venezuela to kill the civilians....the new Syria is happening in your back yard....the number I heard was 60,000, but I find it hard to believe. I heard China sent a lot more. The problem is that the Venezuelan soldiers wont shoot their own, but the Cubans and the Chinese, dont care...they will and they are doing it as we speak. I hope Maduro keeps the power for the next 20 years,, so idiots like you end up in Miami, living on Social Assistence and MediCare. The US stance of Cuba is outrageous. Being frightened of a socialist regime demeans America's claim to be the Land of the Free". If the USA only believes it can win the argument for a free market economy by bullying a small dissident nation it shows weakness and unthinking tunnel vision. Move on America, you are embarrassing your friends. Thank you, Colmery. Yes this insane policy on Cuba is truly a disgrace for all of us Americans as it makes us all look bad. We're already the most hated nation in the world today and this ignominious policy is in no way helping us out! I wonder just how much the right-wing thugs in Washington paid the M&T Bank to make this decision. Will someone here please tell me? These people are truly disgusting and have no more scrupples than the mobsters do!! !